Recently there has been an explosion of laws that helps commercial cannabis farmers mitigate risk and increase yield. Short cuts around the new laws aimed at higher profit, but at the risk of public healthcare are tempting. Cannassentials, an award-winning grower in Oregon, doesn’t take short cuts, opting for quality instead. Cannassentials has never, nor will ever, use bottled fertilizers or pesticides. Master Grower Shane Budd knows that many growers feel the size of the yield is what matters most. For Shane and the crew on his farm, it is all about the taste, clean burn, and overall enjoyment of the smoking experience. 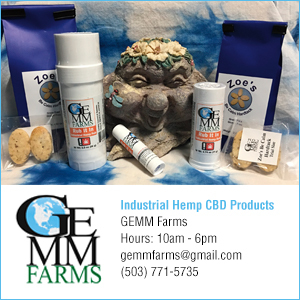 Shane and his team are willing to “bet the farm” that there are lots of folks out there looking for top quality, gourmet flower that is 100% pesticide and fertilizer free. Budd explains the central concept driving the farm’s successful grow methods in this way: “We feed our plants scrupulously sourced plant-based amendments which, unlike byproduct mixes or bottled fertilizers, are full of terpenes.” Terpenes compounded by terpenes make for a prodigiously potent, pungently fragrant, and wildly flavorful flower. This is where the ecological advantages of “living soil” intersect with the company’s quest for consummate quality. What else does Cannassentials do differently on the farm? Asked to reveal some secrets to their success, Shane says, “It’s mostly the living soil – a biodynamic ecosystem full of microorganisms – doing what it does.” He delivers this statement in a matter-of-fact way, but he and his farm crew are truly evangelists of “beyond organic” grow doctrines. They are strictly dealing in plant ferments, composting waste, and applying modern technology to ancient techniques. They work exclusively with a probiotic, closed-loop, regenerative system and warn that “chemicals do not have terpenes!” The no-chemicals statement is a mantra as much as it is a way of life. All farmers will agree that rising with the sun every day (no exceptions!) is indeed a lot of work, but when the flower grown on your farm is being honored with a first-place finish in the Best Flower Nose (Medical) category of the 2016 Oregon Dope Cup, and deemed #1 in GanjaCon’s GanjaCup indoor, outdoor and greenhouse categories (as well as three other recent awards) you know you are onto something worth continuing. Indeed, if folks say you’re an expert in grow methods worthy of cannabis snobs, you take that as a compliment!